Managerial leadership is known as a vital management function next to organizing and planning. It is also defined by experts as the liveliest among the many elements in the process of management. This function works in effectively initiating action which is capable of translating managerial decisions into more concrete actions. If you want to enroll in a managerial leadership skills certification program, then you have to be serious in improving your skills in leading your subordinates through proper guidance and motivation. You have to keep in mind that managerial leadership involves effectively motivating, influencing and directing your employees to carry out essential tasks. It should also be noted that a lot of experts define effective managerial leadership as followership. This means that in order for you to become an effective leader, you have to improve your skills in leading but not to the extent of pushing your employees. You should have the ability in guiding a group and motivating them to follow certain principles and ideals without exerting too much force. Managerial leadership skills also include the ability to guide and direct subordinates through inspired impulses. The entire managerial leadership function focuses on getting positive results through people and organizing staff to form productive groups, departments and teams. It covers the process of creating human structure through proper direction and motivation. If you are serious about earning your managerial leadership skills certification, then it is also important for you to improve your ability to resolve all types of conflicts at your workplace, create a vision that will benefit not only your business but each of your staff and offer resources that will support all the goals of your team. Earning a managerial leadership skills certification is a good way to improve your skills in effectively leading the members of your team and motivating them to work towards a common goal. 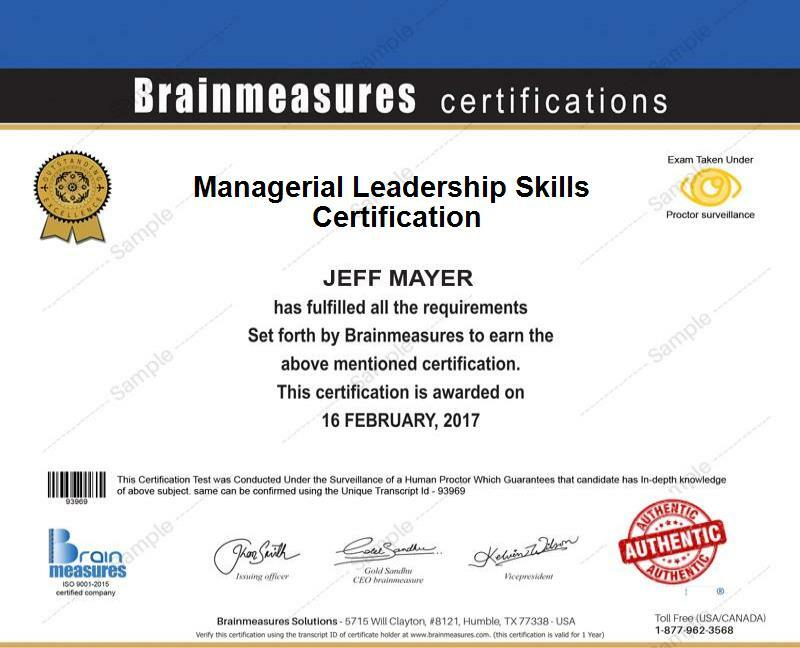 You can take the managerial leadership skills course offered by Brainmeasures if you are serious about getting your certificate in this field. Getting your online certification from Brainmeasures is a wise move because its program runs based on strict ISO standards and is developed through the expert knowledge and skills of renowned professionals in managerial leadership. You will receive the best training when enrolling in the program and undergo the most accurate skill testing process through its error-free managerial leadership exam designed to evaluate the level of your skills and knowledge about the field. You will become a certified managerial leadership skills expert if you pass the leadership skills test which is a part of the program offered by Brainmeasures. There are no admission qualifications and requirements in the managerial leadership skills certification program from Brainmeasures so you need not worry about being unable to take part in it. You can expect a lot of professionals to be greatly benefited by the program. This is the most suitable course for you if you are an aspiring manager or supervisor. This can also work perfectly for you if you are a business leader, project manager or mid-level manager who aims to understand the essential leadership skills needed to guarantee the best performance of your team. Earning your managerial leadership skills certification can also help you out if you have longed to make some positive changes in your annual income. As an expert in managerial leadership, you will get the chance to earn around $57,000 to $141,000 yearly.